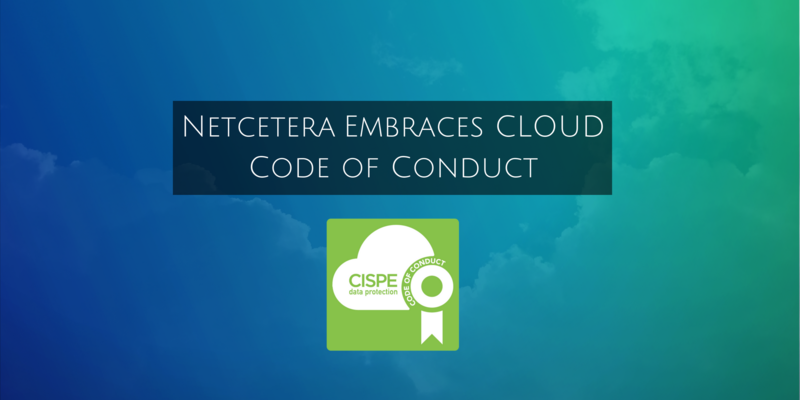 Netcetera is pleased to announce compliance with the new CISPE Code Of Conduct, joining a select group of Cloud Services Providers across Europe who have declared to provide their clients with the choice to store and process their data within the European Economic Area. Netcetera is the first and only Cloud Services Provider from the within the UK, the first European Carbon Neutral Cloud Provider and the only Cloud Services Provider from the Isle Of Man to achieve this new compliance mark. Only Cloud Service Providers that adhere to the new European Standards will be entitled to display this new mark of compliance. This new standard guarantees that Netcetera will not access or use their client’s data for their own purposes, for data mining operations, data profiling or direct marketing. The new Code Of Conduct can be used by customers seeking a provider offering Cloud Computing Solutions, as a reference to establish whether a Cloud Service appropriately and transparently protects the data they want to keep. This new Code Of Conduct will bring benefits to both customers as well as service providers. With the European Data Protection Regulation (GDPR) coming into effect in 2018, Netcetera is pleased to anticipate any changes this may bring along by taking advantage of the situation to show existing clients and potential new customers that it champions transparency, security of data and freedom of choice by agreeing to comply with the new European industry standard. Many of Netcetera’s clients have asked the question about the processing of their data, where is is stored and ultimately what it will be used for and who will have access to it. It is essential for many of our own clients to be able to demonstrate that their Cloud Hosting Provider adheres to the strictest regulations for data protection. Netcetera has always taken data protection seriously and already has achieved ISO 27001 for Security Management Systems. This new standard further demonstrates the company’s commitment to deliver the highest standards available for data protection. Netcetera’s Carbon Neutral Enterprise Cloud provides the very best in cloud computing with 24/7 support, security, speed, reliability, choice and scalability all as standard and at a very affordable monthly price, making this Cloud Computing Solution as easy choice if you want the very best hosting for your data. Check out your new Cloud Solution today! Simply visit our website today or call our friendly experts to find out how we can help you get the very best Cloud Computing Solution for your business. Next: Next post: Announcing Our New 16 Core Dedicated Server – From Only £150.00 per month!